Makeup I would love to do! Photographers I would love to work with! The make-up artist is your last front to the world, so you never want to piss them off, because they'll mess you up. I'm available for Bridal, Print, Runway, TV, Events, Pageants and Special Occasion Makeovers. Please message me or you can email me at [email protected] if your interested in my services. Rates are reasonable and negotiable...So please don't hesitate to ask...Mahalo! Worked with Toni P Farley? Share your experience and become verified! I've worked with many Photographers and Makeup Artist who I GREATLY appreciate! ( Biyoushi, LLC. )...Love you girl! 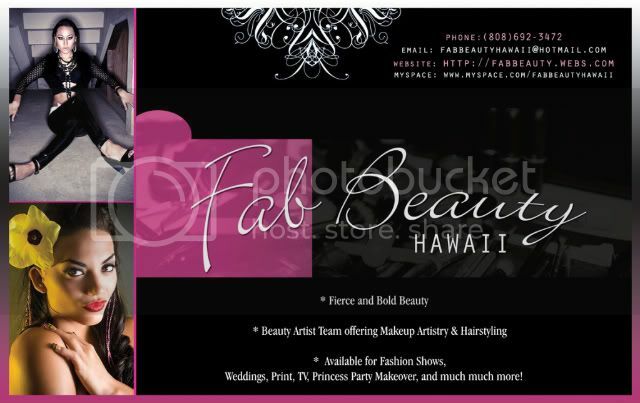 Ryan Kerns, Aaron Bernard from Liquidlight Images, Jam Designs Concepts and my makeup team of FAB BEAUTY HAWAII! Very talented artist. I admire your skills. Aloha and thank you for the friend request. It is a privilege to know a great MUA and stylist. Absolutely amazing work, best regards to you always. Your work is incredible Toni! I love it.